MYNAME, who had matured and manly songs after their debut, recently made a perfect transformation into cute hip hop rascals, but they are now back with an upgraded 4th single album “Just Tell Me”. We are revealing to our Mnet family MYNAME’s relaxed recording studio and even dance practice room for the addictive song “Just Tell Me”. About a month and a half after their previous album promotions, MYNAME is back again with their 4th single album’s title track “Just Tell Me”. It is a hip hop song that mixes a funky rhythm base with a trap sound, and was a collaboration between BlueBridge’s head composer Kim Gunwoo and 220volt, who have produced for MC Mong, Supreme Team and even MYNAME’s previous album “Too Very So Much”. The addictive yet simple melody and witty lyrics brought out the individual personalities of the MYNAME members, and expressed the playful feelings of a man who loves a woman, but is still unfamiliar with love. With an upgraded funky hip hop sound as compared to their previous album, the expectations for this album are high. – Tada~~ This is the recording venue for MYNAME’s 4th single album “Just Tell Me”! – MYNAME is preparing hard before they start recording to ensure things go smoothly! – After preparing well, MYNAME went in to record the track. Different from their usual playful selves, MYNAME has transformed into serious men~ Indeed, men who focus on what they have to do make your heart flutter, right? – Hold on! What is MYNAME doing during their break? Seyong is watching something on his laptop, the youngest Chaejin is eating snacks, JunQ is absorbed in a pop-up book, Insoo is enjoying his break by taking selfies, and leader Gunwoo is preparing hard for recording even during his break! Even through photos, you can see the members’ individual personalities! – This is MYNAME’s practice room! You can see MYANME’s serious looks while practicing their choreography. – MYNAME is taking a break from practice. Even during their breaks, they either practice more of check the lyrics for their singing practice! MYNAME don’t stop to rest so that they can improve themselves. ■ MYNAME’s signed message for the Mnet family! Gunwoo: Mnet Music!! 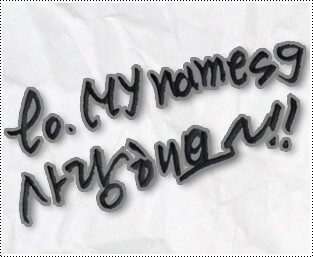 This is MYNAME!! I will always work hard~!! I love you!! Seyong: To. Mnet Music. Please support “Just Tell Me”. JunQ: To. Mnet Music!! MYNAME is back after a month!! Please support “Just Tell Me”!! This entry was posted on May 16, 2015 by mynamesg. It was filed under Editorial .